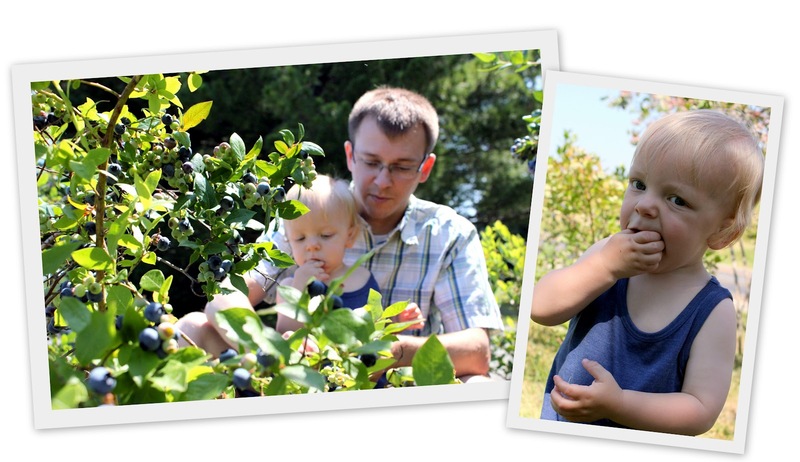 This past weekend we were finally able to pick some blueberries at Mark's parents house. It was beautiful out and as you can see, the berries were ripe for picking. 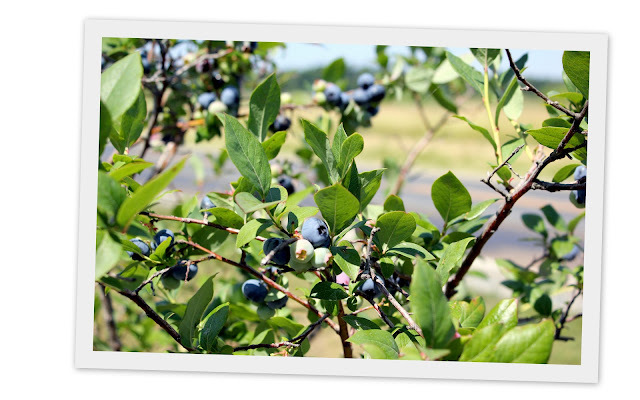 Behr was a master at getting them off the plant, and even better at plucking blueberries from the bucket. For every three berries that made it in the bucket, at least one or two made their way back out thanks to Behr. I couldn't snap a photo of him without his handfull of blueberries in his mouth. He was eating them so fast, we are lucky we were able to bring any home. Turns out, we were very lucky that a few berries made it home with us. An impromptu al fresco dinner with friends Monday night left me without much time to think about dessert. Starting to catch up from being out of town, getting ready for the week ahead, two evenings of cooking dinner for friends, and preparing for a major work trip next week, I was thrilled that baking was not on my to my to-do list. 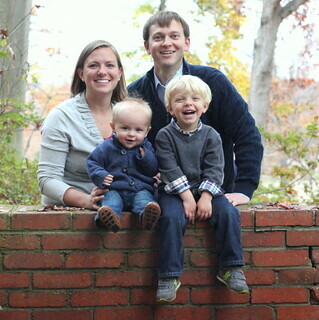 However, hosting dinner was the furthest thing from my mind. And while dinners typically come easy to me, I often struggle with what to make for dessert. Fortunately, I had the ingredients on hand to make my favorite summer treat; store bought pound cake, fresh berries, and COOL WHIP Whipped Topping. especially when it tastes this good! I love having COOL WHIP on hand from everything from my Dad's cookie pie, to rich chocolate trifles around the holidays. COOL WHIP goes great with chocolate and better with berries, the perfect summer dessert. 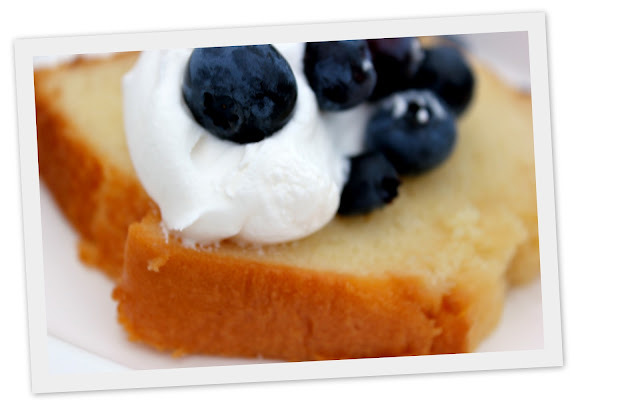 The pound cake is good too, but let's be honest, it is basically just the foundation for the toppings. This is bound to be our go-to all summer long. Strawberries, blackberries, raspberries, you name it, the possibilities are endless. 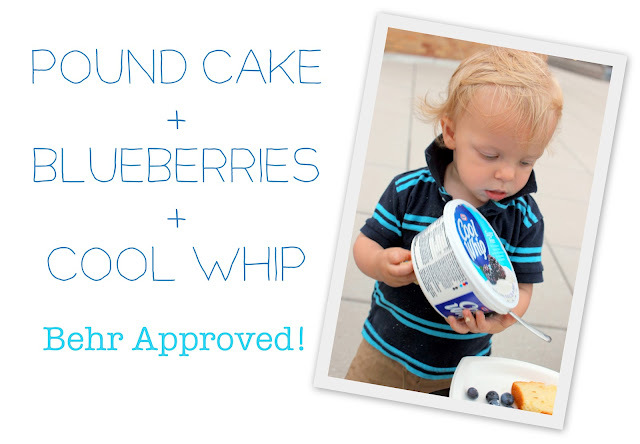 And the best part for a busy mom like me, COOL WHIP is easy to have on hand, and berries are a staple in our home. Behr seems to agree. His first time trying COOL WHIP, we started him off with a small portion, but he's a smart kid. Behr knew what was good, so went back for seconds. He was so intrigued by COOL WHIP and why it was on his blueberries. He was also quite entertained by the tub, giving the adults a chance to finish our own dessert. We were entertained by how well his outfit matched the tub. Behr would make a great spokesperson, don't you think? sponsor. Advertisers do not produce the content. I was compensated for this post as a member of Clever Girls Collective, but the content is all my own. That looks yummy! Do you have the book "Blueberries for Sal"? I think it needs to be in Behr's library. I kid you not, Julian could survive on cool whip and cool whip alone if I let him. He gets it from his father in case you're wondering. Yummmm that just SCREAMS summer! OK last comment and then back to work. I love that Cool Whip sponsored this. I feel like it's Anne of Avonlea... except it's not Rollings Reliable.